Ballybofey-based Pat McGowan Transport Ltd is a quality conscious refrigerated transport company. 2016 sees them reach the milestone of 30 years in business and, to mark the occasion, we spoke to company founder Pat McGowan. A lot of hard work and long hours,” Pat McGowan replied when asked how they have successfully managed to navigate the choppy waters of the topsy-turvy economic climate over the past three decades. “There's only a few remaining international haulage firms left from the early but we've been very lucky in the sense that we're one of the few transport companies in the country that still has loyalties with customers that stretch back to day one. 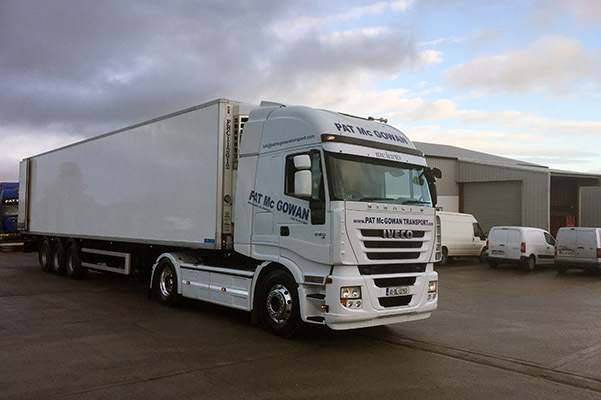 Established in 1986, Pat McGowan's Transport has grown to offer a complete transport solution for their customers, including both storage and transport. A family-run operation, Pat McGowan Transport Ltd has 15 employees on its payroll including Pat's son John who is the company's Managing Director. They operate a fleet of 12 modern trucks and 14 trailers, all equipped with GPS tracking, and cover Ireland, the UK and Europe. 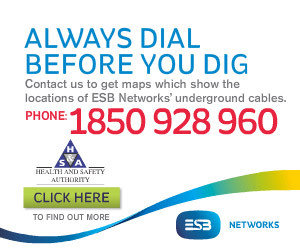 Their aim is to offer a consistent, efficient service to suit their customers ever changing needs. The wide range of services they provide includes national and international refrigerated service, full load, part load, temperature controlled/ambient, storage and cross docking. While the company retains it strong links with the fish industry, recent years have seen major expansions into other temperature controlled markets. “We specialised in fish export and also imported fruit & veg in the early days,” Pat recalled. “But we have had to diversify from fish. The fish industry has had its fair share of problems, as everyone knows, the same as transport, and we had to cut our cloth accordingly. Offering competitive rates, the team at Pat McGowan Transport are dedicated to customer satisfaction. Consequently much of their business comes from word of mouth and satisfied repeat customers. A vital component of the well-oiled Pat McGowan machine is their highly skilled and competent drivers. Attention to detail and a policy of continually updating their fleet also helps Pat McGowan Transport stay a couple of steps ahead of their competitors. For more information on Pat McGowan Transport Ltd and the services they provide, give Pat or John a call at the numbers above.